Love Sriracha sauce? Try our Cheesy Sriracha Burger tonight! 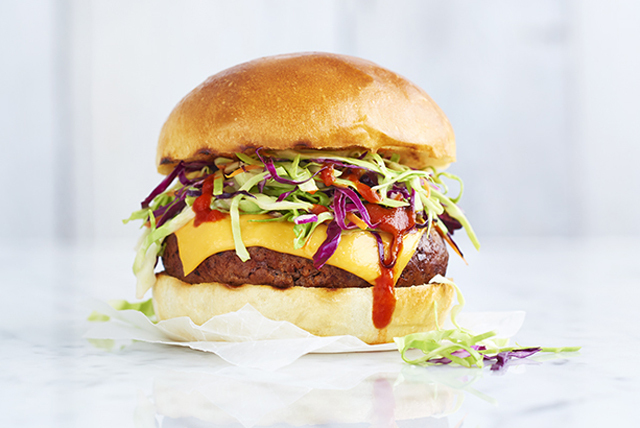 Our recipe features a delicious cheeseburger spiked with Sriracha, topped with coleslaw and a final drizzle of Sriracha - all served in an artisan-style hamburger bun. Toss coleslaw blend with Miracle Whip. Refrigerate until ready to serve. Mix meat with 2 Tbsp. Sriracha sauce just until blended; shape into 4 (1/2-inch-thick) patties. Grill 6 to 7 min. on each side or until done (160°F); top with Kraft Singles. Add buns, cut sides down, to barbecue. Grill 1 min. or until Singles are melted and buns are lightly toasted. Place cheeseburgers on bottom halves of buns; top with coleslaw. Drizzle with remaining Sriracha sauce; cover with tops of buns. Made from a paste of chili peppers, distilled vinegar, garlic, sugar and salt, Sriracha sauce is a type of hot chili sauce originating from Thailand. Look for it in the condiment or Asian foods section of your grocery store. Substitute 8 slider buns for the artisan burger buns. Cut Kraft Singles in half. Shape meat mixture into 8 (1/2-inch-thick) patties. Grill 3 to 5 min. on each side or until done (160°F). Top with Singles pieces. Add buns, cut sides down, to barbecue. Grill 1 min. or until Singles are melted and buns are lightly toasted. Continue as directed.